Imagine a sitcom that brilliantly plays up all the negative aspects of modern life. Imagine a student, who arrived in a posh car to listen to a lecture, get out of the car and enter the building. A professor watches him. The car is parked next to an advertisement with a slogan - "SLI is a road to success! We shall revitalize economy and help you! Invest in our company! We know how to make the money work and generate excellent dividends!". Professor Array Tech Incanadovich, swearing silently, angrily wipes his glasses, his eyes glowing with malice... He has been working like a mule for all his life, achieved regalia, titles... He got everything he wanted (cars, villas, etc), but the times have changed... Some snotters now drive posh cars... And some SLI... Another trickery... His anger gradually switched to this company, as A.T.Incanadovich is academician in economic sciences, all these advertisements stick in his craw. His students, knowing the ways of their processor, have already noticed that he is out of spirits. "A.T.I. (these are his initials) will be grumbling again" said somebody from the upper row of the classroom. Some time passed... Professor's son founded a company that specialized in the same investment projects, stock jobbing, as the notorious SLI. The son also involved his father and professor Incanadovich made a lot of money besides the modest wages in the University. They called the company CrossFire, implying their firy nature not to be obstructed. And this very professor without any remorse complimented CrossFire on his lectures with the same ardour as he previously abused SLI. Here is the question: if the CONCEPT of Company A is bad and severely criticized by Company B, does the latter have a moral right to do the same six months after? If it has, it doesn't mean that the concept is bad. Maybe the only fault of Company A is that it was the first to invent it? I guess you got the hint. If you still don't, I'll tell you that at the end of 2004 ATI criticized SLI for its hopelessness, bugs, and otiosity (that was true at those times), but then it launched a similar project, of course, much better in its opinion. A strange position. All right, the company did it. One more technology appeared - we have a choice now. It's good. So, long ago in May (nearly six months ago) there appeared an idea to unite two (or more) accelerators to provide more performance and some qualitative innovations. I repeat that the similar concept from NVIDIA called SLI appeared much earlier. We wrote about CrossFire (that's the name of the SLI competitor) in spring. Our readers may refresh their memory and read it for the second time. I shall not describe it in detail, as this article is devoted to the practical aspect, that is to tests. I repeat that the main objective of this technology is to organize rendering team-work for two video accelerators. This architecture must be not only effective (high efficiency, low costs of additional schemes, availability for common users and enthusiasts), but also convenient to use (compatibility with the existing programs and even with existing hardware solutions, limpidity, simplicity, and reliability). The above-mentioned article was certainly based on forecasts. That's why much of its overly optimistic points have either lost their brilliance or failed. Especially it concerns the terms. The launch of CF had been postponed several times. NVIDIA managed to do a lot to dull the brilliance of the new product from Canada for this period. Firstly, the company improved its drivers and eliminated a lot of problems with SLI (it has been constantly debugging negative issues). Secondly, motherboards and video cards have already dropped in prices. 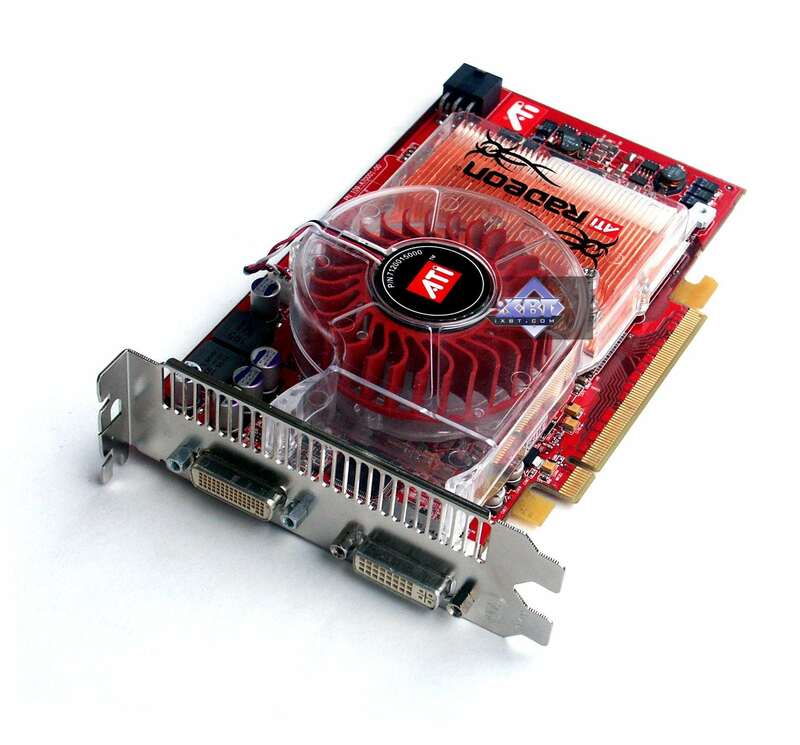 Thirdly, SLI is already available to low end models, up to the 6600LE. Fourthly, at the end of the month we shall see the drivers that will allow SLI for cards from different manufacturers and even at different frequencies. A range of products is launched that initially raises a lot of questions. Firstly, previously unavailable motherboards on ATI RD480 (I don't understand what takes them so long, the first samples were demonstrated at Computex in early June). 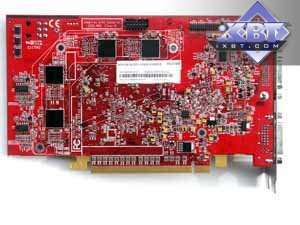 Secondly, so called master cards are not yet available and we don't know when they appear - modifications of the X850XT, X800 with CrossFire processors. Thirdly, it's not clear for whom it was done due to the first two reasons. That's why there is only one option - it's all necessary for the future. What's going on now is just streamlining. But the R5xx, RV5xx cards in CF mode will demonstrate all advantages of the new technology. We'll see. By the way, right before the NDA there appeared information that CF will also work on i955-based motherboards with two PCI-E slots. According to some information from Japan, this triumvirate is not properly stable so far. So the RD480 is still the main basis. 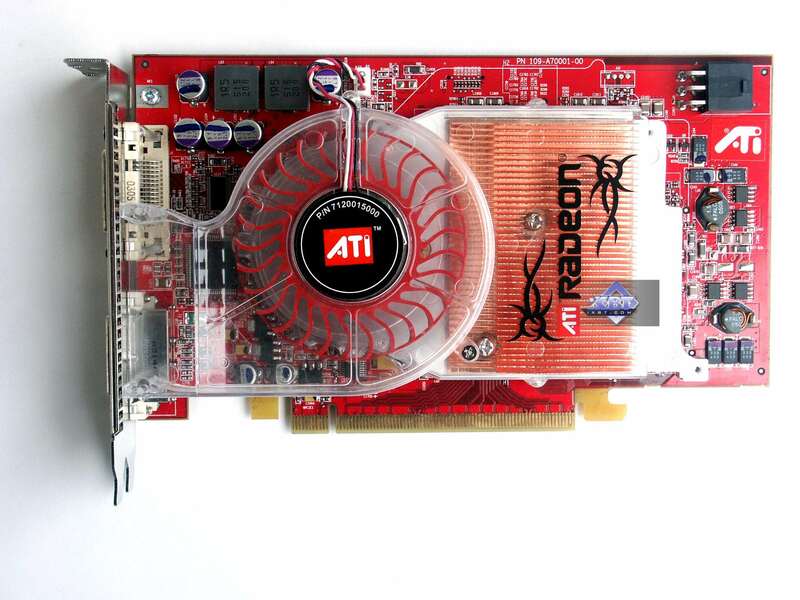 ATI provides a whole kit for testing, that is a motherboard and two video cards based on RADEON X850 XT. 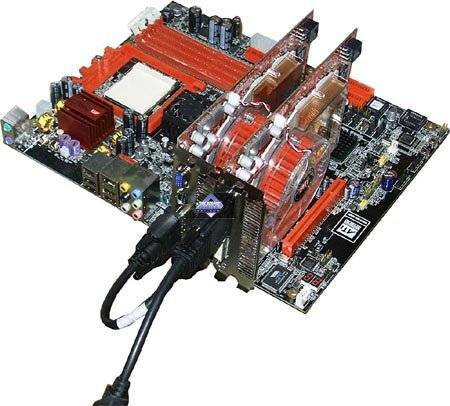 I shall not dwell on the motherboard, as the second part of the article will describe it and its operation in detail. Even though the user's manual shows that the X850XT CrossFire Edition (master card) should be installed into the first slot (from the CPU), this installation resulted in a blank monitor... It turned on and displayed a black image. We improved the situation by swapping the cards. So you should keep it in mind. We classify it as a drawback from ATI, whose specialists either made a mistake in BIOS or confused the slots in the user's manual. Both cards form CF via a special adapter (you can see it on the photo above). The so called master card has a special connector for this adapter instead of a DVI connector. 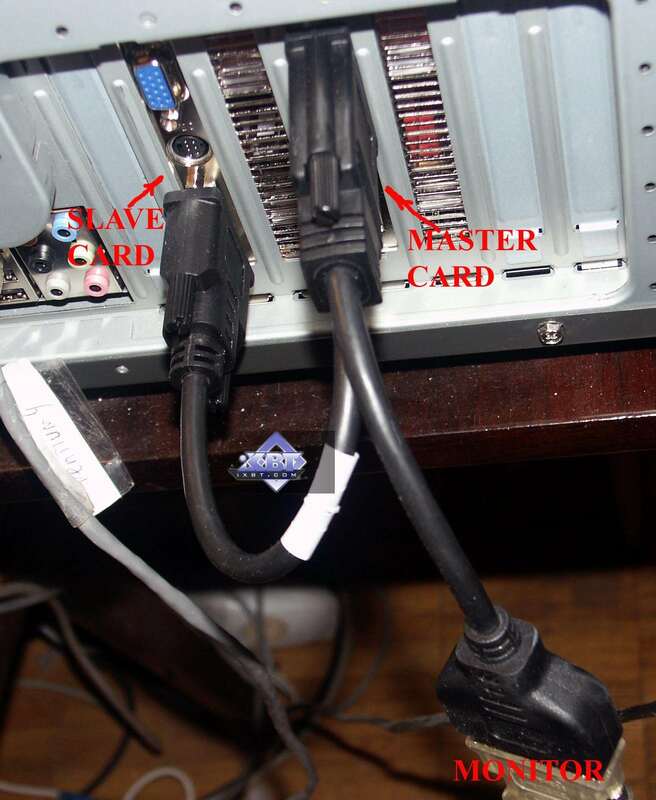 The other two ends are connected to the slave card and to the monitor (there is a DVI plug at the end). It should be noted that this layout blurs the startup screen (BIOS, CMOS Setup) a little on a CRT monitor. However, it had no effect on the image after Windows XP drivers were loaded. We shall touch upon it later. And now let's have a look at the video cards. Dimensions: 190x100x30mm (the last figure is the maximum thickness of a video card). 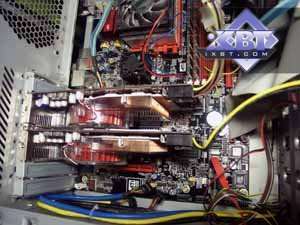 ATI RADEON X850 XT CrossFire Edition 256MB - CF, DVI, S-Video. 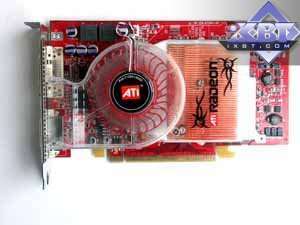 ATI RADEON X850 XT 256MB - 2xDVI, S-Video. I guess there is no need to mention that the so called slave card, which can be any X850 XT card (or even the X800/X800XL), is just a copy of the reference design. So we shall not review it, we have already reviewed such cards many times. But the ATI RADEON X850 XT CrossFire Edition 256MB has some differences. Firstly, it's a special connector in place of the upper DVI, I have already mentioned it. Secondly, two new processors for the CF adapter, plugged to this connector. 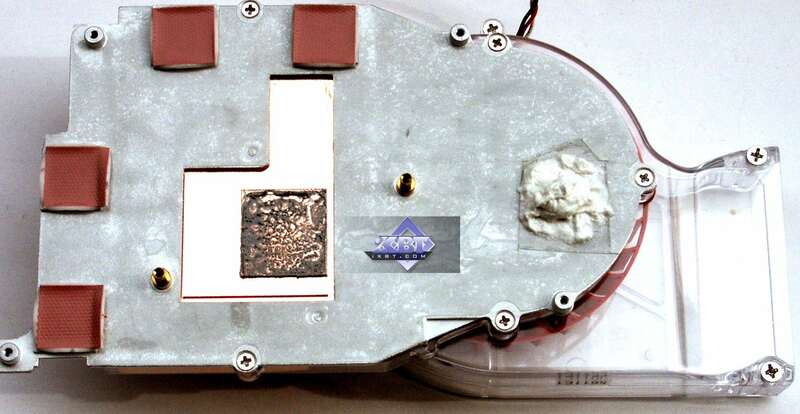 The latter gets heated and so it's connected to the cooler on the video card with viscous staff as a thermal interface. 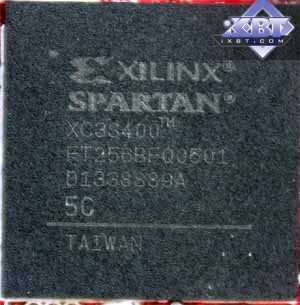 It's a processor from Xilinx. It's necessary to combine signals (speaking in plain terms). It has local programmable memory. 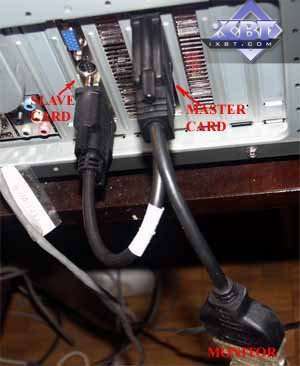 For this purpose, the so called master card has a connector in the upper part of the back side. It's used to program the processor using a special equipment. 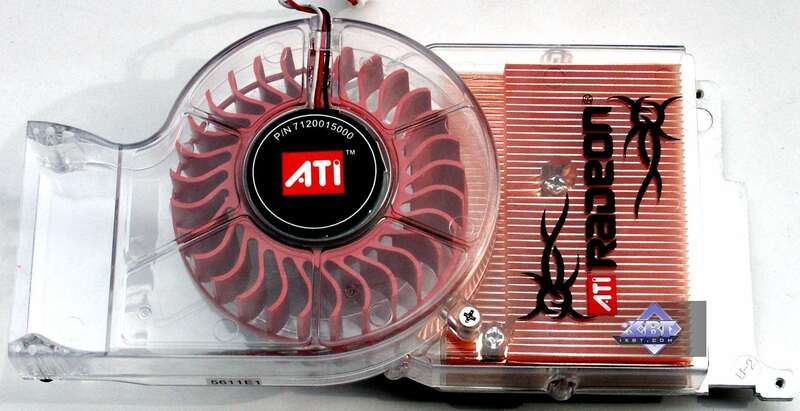 By the way, that's the reason why the ATI RADEON X850 XT CrossFire Edition cards are not available, they cannot be manufactured by ATI partners on their own: all these cards must go through the ATI office, where the above-mentioned chip will be programmed. I hope that as the technology develops and advances, there will appear more places to program these processors. So there will be no bottleneck in the ATI office. 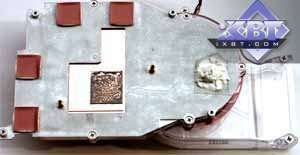 The first chip on the photos above is PanelBus DVI Receiver 165MHz, HSYNC fix from Texas Instruments. 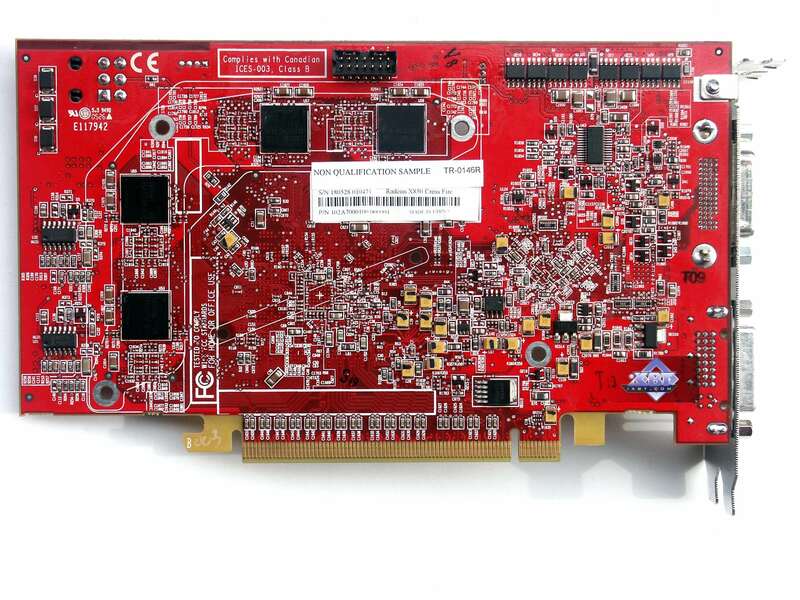 This processor is necessary to maintain high quality DVI signal. 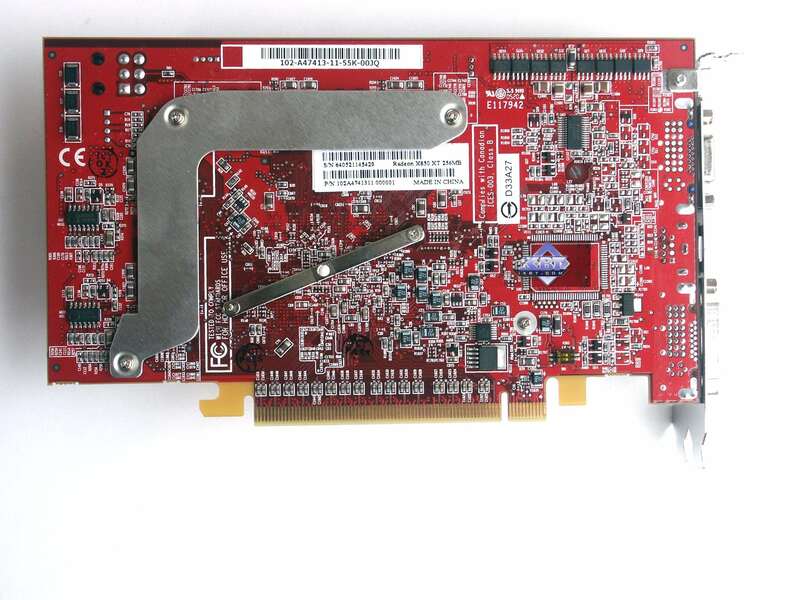 It should be noted that the usual X850 XT card is equipped with a couple of DVI connectors. Reference cooler, we have examined such a cooling system for many times. A massive turbine that blows the air out of the chassis. The turbine on regular X850 cards drops its rotational speed 2-3 seconds after startup. But the master card generated powerful blow-out and turbine roar for the entire operation period. There are both pros and cons here. I have already mentioned the disadvantage - the noisy cooling system. A great advantage - two coolers on both accelerators blow the hot air out of the chassis. Remember that one of the major disadvantages of High-End cards from NVIDIA in SLI mode is that the coolers drive the hot air against the general air flow inside a chassis, which does not contribute to the cooling efficiency on the whole. And if you take into account two heated accelerators in the system unit, things look blue without powerful hot air blowout. In conclusion of the review it should be noted that the cards are not equipped with a VIVO (VideoIn,VideoOut) codec. While the master card simply has no room for Rage Theater, the regular X850 card has some empty room, but the chip is not soldered. Taking into account that all these cards are samples, the box and bundle are out of the question. The cards come shipped with all necessary cables and adapters (DVI, HDTV, CF-adapter). 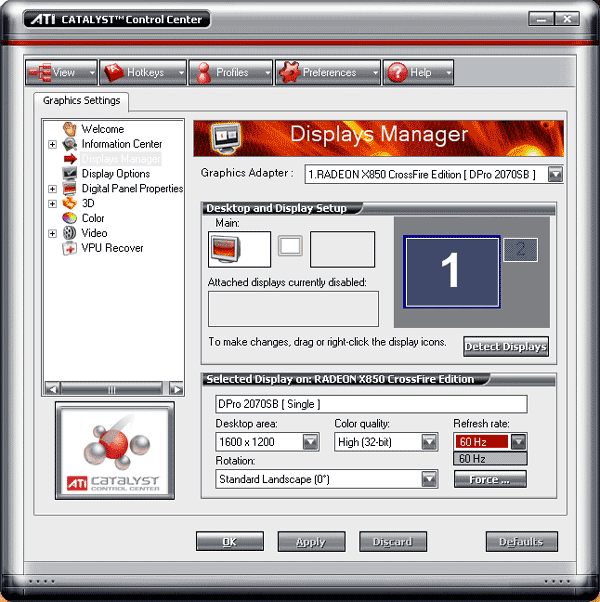 ATI CATALYST 5.9beta; NVIDIA Drivers 78.01. Here is one more sad issue. If we connect a monitor to the master card with a CF adapter (it does not matter whether the second card is installed or not), owners of large CRT monitors will see a nasty picture: you can work in 1600x1200 mode only at 60Hz, which automatically crosses this resolution out, because users will not want to ruin their eyesight. That is another cohort of users is automatically cast away from potential buyers of CrossFire systems. Of course, all marketing specialists from the Canadian company will shout that only a few users, who buy such systems, can afford a large LCD monitor, so it's not a problem. And of course, NVIDIA the competitor will bring forward this disadvantage and highlight it as a disaster. With the same ardour it will shout that large LCD monitors are too expensive so far and thus the owners of 19-20-22-inch CRT monitors can forget about 1600x1200. In my opinion it's an evident CF disadvantage. Considering that there will not be many users falling for the delayed launch of such systems, the company should have calculated everything and launched a product without ANY EVIDENT hardware disadvantages. In order not no lose a single potential client. The Canadian company seem to have given it up as lost, or all Toronto users have 20" LCD monitors. ATI representatives don't like to poke their noses outside their domain. But this is not a fatal disadvantage, you have to admit it - there are much more owners of cheaper monitors, which resolution is 1280x1024. A monitor connected to the bottom DVI of the master card displayed a usual picture and offered all resolutions possible. But don't forget that our lab has only CRT monitors with analog input. I cannot predict the reaction of LCD monitors with the digital interface. I guess everything will be OK, as the resolution limit in CF mode is the fault of the SI1162 chip installed on the master card, which has the above-mentioned limitations. It's not clear why a more powerful processor is not used. 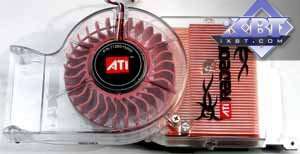 What concerns the new AA type, I have already examined the SLI AA 16x quality in the article about ASUS 7800GTX. 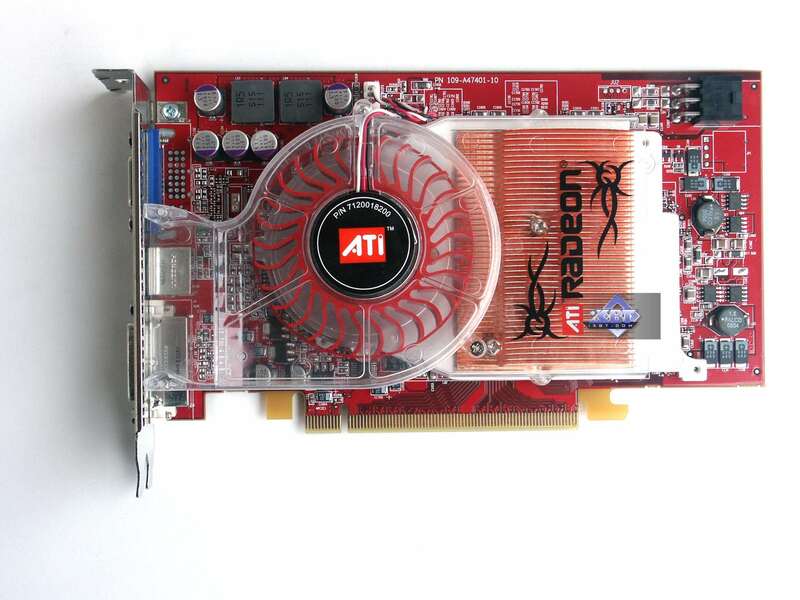 The AA 14x quality from ATI is nearly on the same level. Besides, we have already proved before that these modes are actually for marketing, as they will not be necessary - in most cases the standard modes are sufficient. Now about CF operating methods. You may know from our article that there are three modes. The first method just splits the screen horizontally in two and distributes the halves between the cards. The second method is tiling, where each card processes its own tile. The third mode is alternate frame rendering. It's up to the driver to choose a method. A user cannot set a CF method manually (theoretically it's a disadvantage, the lack of choice always is). However, if a user disables A.I. in drivers, all DirectX applications will use only the second method and all OGL applications -only the third one. When A.I. is enabled, by default the CF method is specified in profiles for each game, stored inside the driver. I have a question: what can the X850XT tandem be compared with? My guess is with a similar tandem of two 7800GT cards (for an obvious reason, the Canadian company does not publish this comparison in its materials), because these cards are almost equal to the X850 XT in price. And of course, it's reasonable to compare with the 6800 Ultra SLI, as such tandems have been on hands of some pro gamers for a long time already. Besides, the 6800U price goes down, considering that the product is discontinued. We should note here that we didn't manage to TEST ANY SLI mode on the reference motherboard from ATI, as the system just failed to start up with two NVIDIA cards installed. But everything worked fine with a single card. That's why we shall compare with cards on the NForce4 SLI platform, as specified in the configuration. Comparison with the RD480-based cards will be published later, in our 3Digest. The universal i955-based platform (both for SLI and CF) is impossible for technical reasons so far. 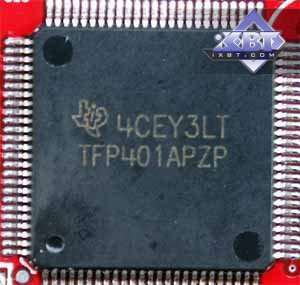 Besides, as I have already mentioned above, CF is very unstable (so far) on this motherboard, according to the info from Japan. There will be only one cross-platform comparison - based on X850 XT tests (RD480 tests are marked). And one more thing: the reference motherboard does not have a hardware PCI-E mode switcher, only BIOS allows to enable/disable CF. But it changes nothing: there are only eight lines on each slot with two or one card running, that is PCI-E x8. Irregardless of ATI or NVIDIA. 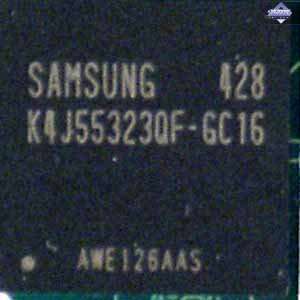 Considering that FC depends much on a processor, the 55% gain provided by CF is quite good. The tandem nearly outperformed the 6800U SLI. It surpassed the 7800GTX. But the 7800GT SLI managed to fight back - parity. We have no gripes with the quality. It's an obvious bug in drivers, as the CF performance is lower than a single card demonstrates. So there is no point in comments. So we just refer this test to failures. We have some gripes with the quality: the tiling would periodically appear on screen, revealing the CF method. By the way, NVIDIA experiences similar problems with SLI performance in some cards in this very test. Perhaps, optimizations are made for the final game version, while we use a beta. CF demonstrates an excellent result! The gains are very good versus a single X850XT. The 6800U SLI, 7800GTX are defeated. 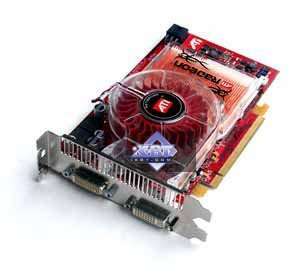 Only the 7800GT SLI is better. Don't forget that the conditions were not quite equal in this test: all NVIDIA cards worked with Shaders 3.0, while ATI cards worked with Shaders 2.0. Unfortunately, game developers provided us with no options. This game depends more on a processor than FC, so CF demonstrates lower gain. All the achievements grew dull and the competitors turned out a tad faster. We have no gripes with the quality. Despite the excellent performance gains demonstrated by the CF tandem versus the single X850 XT, competitors from NVIDIA are still stronger. No wonder, they have been stronger in these games for a long time. Besides, the OGL driver from NVIDIA has been fine-tuned from time immemorial. Everything is copacetic here, corresponding to the specifications. The 7800GTX is outperformed (of course, the total of 32 pipelines at 520 MHz will be obviously faster than 24 pipelines at 430 MHz in terms of shader performance). The 6800U tandem is stronger, its optimizations for this test are better fine-tuned than in ATI (the SLI gain reaches nearly 100%). The defeat from the 7800GT SLI tandem is only natural. It should be noted that our conclusions are only intermediate, we shall publish the second part of this article with a review of the motherboard on RD480. But even that is not the most important thing. CrossFire will reveal its strengths and attractions together with new R520-based products from ATI. That's where our conclusions actually start: CrossFire exists, it really works. But there is an aftertaste of incompleteness. A similar situation was with the ASUS Dual 6800GT (this card is too large, it will hardly go beyond test labs and reviews). The reason is probably in buggy BIOS. It's a reference board and thus it will never appear on sale. There is no news about the master cards either. None of the ATI partners confirmed that they have them and are ready to launch them on the market. We don't know prices for this card either... The fact that different cards can work in tandem is hardly an advantage, as a more powerful card will not be used to its full capacity. And the notorious limitation of the master card to 1600x1200 and 60Hz in CF mode... The catastrophic performance drop with AA14x is quite natural (SSAA!). Few users will need this mode as well as AA16x for NVIDIA SLI. Heated arguments as to what technology better evokes a smile at best. With such performance, it is difficult to find a modern game to satisfy a user, who has spent a huge sum of money for a motherboard and two video cards (no matter whether CF or SLI). A little asset in this dreariness is that CF must potentially work on i955-motherboards as well. If an equation has so many unknowns, it's impossible to solve it. So it's very difficult to draw conclusions. One thing is clear: this technology appeared too late; it will be very hard to compete with NVIDIA SLI, considering what foothold SLI has already gained on the market (to say nothing of the price for the first RD480-based motherboards (even motherboards on i955 are not cheap) and decent motherboards on NForce4 SLI). 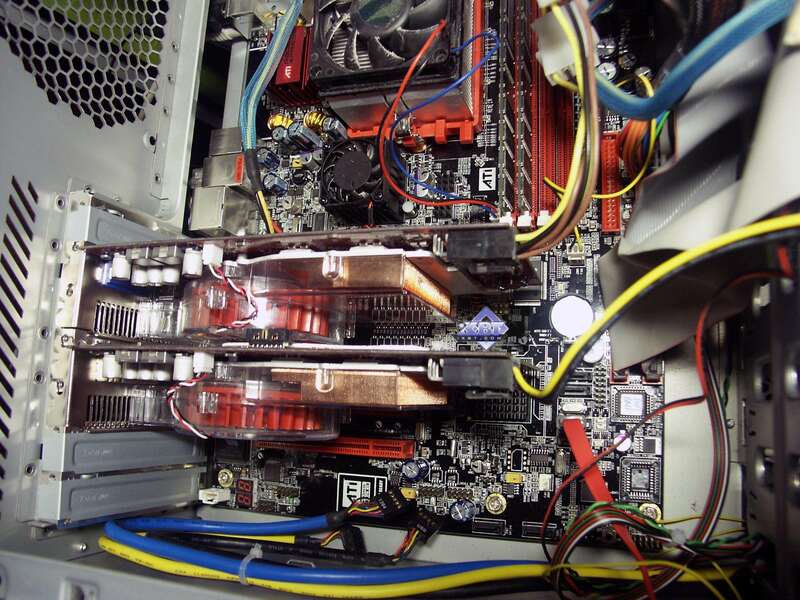 CrossFire should be improved, its drivers should be perfected, its motherboards must be launched faster. With the release of the R520, there may appear potential buyers, who will want to upgrade their platform entirely (they will have to buy a new motherboard anyway). If all goes well for ATI (it will be up to its policy), clients will stick with CF instead of SLI. Even if X850 XT master cards and RD480-based motherboards (or i955-based boards with two PCI-E x16 slots) appear on the shelves tomorrow, there will be absolutely no reason to buy them now, as there are solutions, which are not only cheaper, but even more interesting and promising (the only reason to buy such a motherboard now is reckoning the future upgrade). I repeat that in my opinion, CrossFire is a worthy technology with good prospects, but in future only. As for now, we have just made sure it works. Thank God. Four months passed since the announcement. It's not clear what ATI specialists had been doing PRIOR to the announcement in May that they wouldn't fine-tune CrossFire for the whole summer. 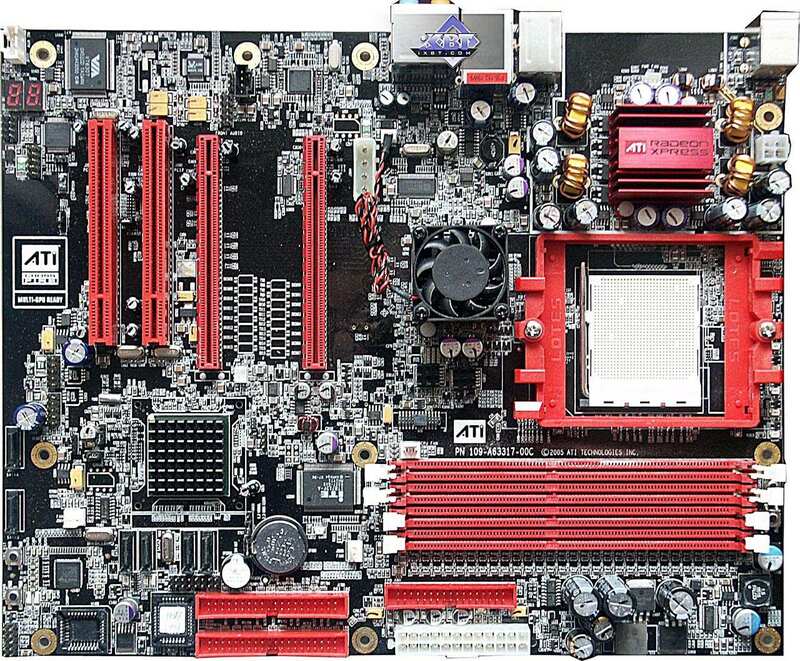 Stay with us, we shall soon publish an article about advantages of motherboards on RD480. Final conclusions will be made in four or six weeks, when production-line motherboards on RD480 and a couple of R520-based accelerators appear on sale.